Just about every time I've drawn a drunken room's attention to play a so-called party game (maybe the card-based Ultimate Werewolf or the mobile-based Spyfall), interest has run dry before the game even begins. I guess they can't be blamed; party games are meant to be ice breakers, and I think our drunker selves all find login URLs and convoluted deception strategies rather icy. But personally, I'm sentimental for the partygoers' toast, that moment where many scattered discussions unite under one central focus. I have found that party games lure even the unassuming wallflowers up to the social surface to make their contribution, and that's why they interest me. Among party games, Drawful draws the room together more quickly than any other I've played. It's hosted by console, displayed on TV, and played from smartphone. Open your browser and enter the code displayed on the screen. Bam. You're there. Then, each player privately illustrates a random prompt. Some prompts are cute, like "tables vs. chairs"; some are downright horrid, like "peahen eggs," or, gods forbid, "Dignity." In the next stage, each drawing is displayed for all to see, one round at a time, and players submit their anonymous guesses as to what the drawing is of. Then, players vote among the submitted answers, which are indistinguishable from the truth. The artist-player earns huge points if their drawing distinctively matches the real McCoy, while the guesser-players earn half points if they can bait out votes for their lies. It's Pictionary-Balderdash, for witty players will quickly realize that if they can't deduce the true clue (your guess is blocked if it's exactly correct), their best chance is to submit a phrase sounding true-...ish. Other times you can win votes by charm alone, though the real test of skill lies in conceptual camouflage. I've witnessed one mild-mannered beginner absolutely wreck in this game. When I asked him what his secret was, he told me, "I guess I just know how to think like a robot." Above all, Drawful succinctly motivates a room full of idlers to entertain the hell out of other. For the simple efficiency with which it coaxes laughter, eureka's, and outrage from a diverse group of players, Drawful sets my standard for game of the year so far. 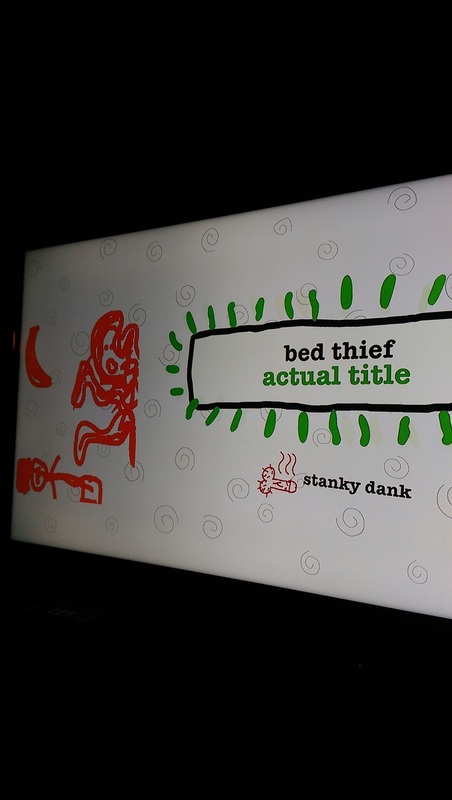 Drawful: Always-hilarious smartphone Pictionary, on PS3, PS4, XBox One, Android TV, Apple TV, and Steam! Half-hour rounds, with a bottomless well of questions.